Not only is spring the time of year people start to worry about spring seasonal allergies but its also the time of year that those pesky insects make their return and invade your backyard BBQ or picnic. There are a number of insects that can cause allergies from stinging or biting, the most common are bubble bees, wasps and fire ants. Bubble bee stings can of course be dangerous to those allergic but luckily the bubble bee is not aggressive and most likely won’t attack unless it feels the need to defend itself. Bubble bees and honey bees are attracted to bright flower like colors, food (specially scents) and water. 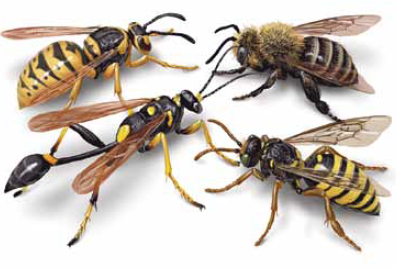 They will leave behind their stinger after stinging and can only sting once as they die after stinging. 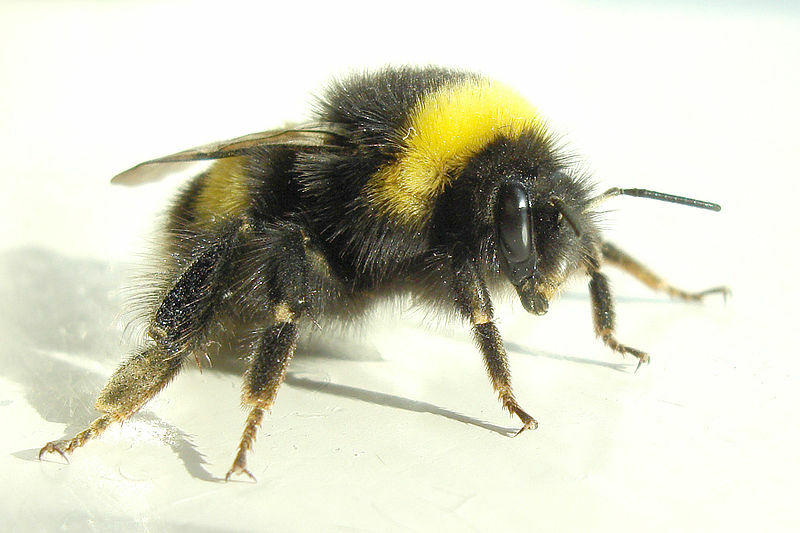 These speices tend to be more aggressive than the bubble bee and can sting multiple times leaving no stinger behind. You can find them nesting in and around wooded structures as well as eaves of houses. They are attracted more to sweet things like sugar or your can of soda pop on the picnic table. 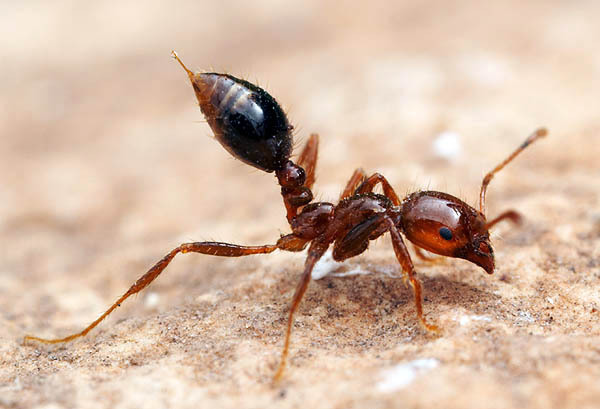 Fire ants were accidentally imported from South America and are quickly becoming a problem as they have spread through much of the United States. The ants live in mounds and can be very aggressive attacking and stinging 6-8 times even if not provoked. The sting can be very painful so shoes are a good idea even if you are not allergic to their bites. Just like your body can over react to something it thinks could cause you trouble your eyes will also have a over reaction to something it perceives as dangerous. Allergic conjunctivitis or pink eye is a common problem for many people. Eye allergies are often hereditary and run in families so look for a family history of them. Eye allergies can be accompanied by other allergy symptoms like a runny nose and sneezing or may occur in those who suffer from hay fever and asthma. If you are one of those people who suffer from eye allergies you must take action to prevent them. Eye Allergies can be very irritating and hard to treat. The worst thing you can do is to rub your eye with your hand, as your hand may contain bacteria and it will only inflame your eyes more. You can try some eye drops to keep them from becoming dry. Some people claim capsules of herbal supplements like eyebright and ginkgo biloba help. You may want apply a cold compress with a clean sterile wash cloth. The old stand by of putting cucumber slices over the eyes will also act as a cold compress and can sometimes help. You might also want to try a soothing eye pillow. Antihistamines and decongestants can also reduce eye allergy symptoms. If you wear contact lenses your contacts could be complicating things and making your eyes feel worse. You might want to switch to regular glasses at times when your eyes are really bothering you. Eye problems are not to be taken lightly. Many serious eye problems could have the same symptoms as eye allergies so its important to get a medical diagnosis. Its important to get eye allergies under control as long term rubbing and itching could cause damage to your eyes. Weight loss is quite tricky and it is not necessary that the regime that has been suiting you and helping you lose weight all this while will work all through the end. In fact chances are that you would get stuck in the last 5 pounds or so. It can be immensely frustrating and annoying being just a little away from your destination. So what should you do to bridge that last gap? Start by first trying to understand your body and its mechanism during weight loss. All the while you subjected your body to a NEW weight loss regime that worked for you body and gave you fantastic results. Bu now after following the same regime for quite some time your body gets “adjusted” to it and reaches a plateau. This is why after losing so many pounds you get stuck in the last bit. So the only solution is to first remodel your workout schedule. This would shake-up the body from its reverie and again starts the process of weight loss. Remember that your body is very flexible; it is up to you to stretch its limits and redefine boundaries. If you don’t push your body further it would easily adapt itself in a routine and refuse to shed more fat. The modulation can be either in your speed or your time. Extend the 30 minutes to 45 minutes and you would not even notice the difference after a few days as the body again starts to adapt to the new regime. Or just increase your incline slightly and see those extra pounds melt away in no time. The second important tip is to include more fiber in your diet. Medical science recommends at daily intake of fiber as 25 grams which unfortunately we don’t reach. Fiber has numerous health benefits apart from being good for weight loss. Introduce whole grains to your diet rather than refined carbohydrates. Also include both soluble and insoluble fibers for maximum benefits. Insoluble fiber is present in whole grains and roughage and soluble fiber is found in fruits such as apples, pears etc. Modulate your diet to include both types of fibers. Even fiber supplements are a good choice for augmenting your fiber intake per day. Don’t overload yourself with fiber lest you may feel uneasy and bloated. Control binge eating no matter what. It’s OK if you suddenly have a craving for chocolates and have a candy but please keep yourself away from gobbling the whole bar down and then regretting it when you measure your weight the next day. If you are planning a regimented weight-loss then don’t banish any food from your life. Just reduce its quantity and frequency. This would keep you away from cravings and going overboard the minute you see them. Also when you feel you are having a weak moment seek solace in your friend, sister, mom or whoever you feel would help pass the time over. All these are just phases and gradually they would become an integral part of your life and shall help keep your weight in check all your life.